The American Cancer Society Making Strides Against Breast Cancer walks raise awareness and funds to save lives from breast cancer. Each event is a noncompetitive 3 to 5 mile walk that brings people together to make a difference for everyone who has been touched by breast cancer. 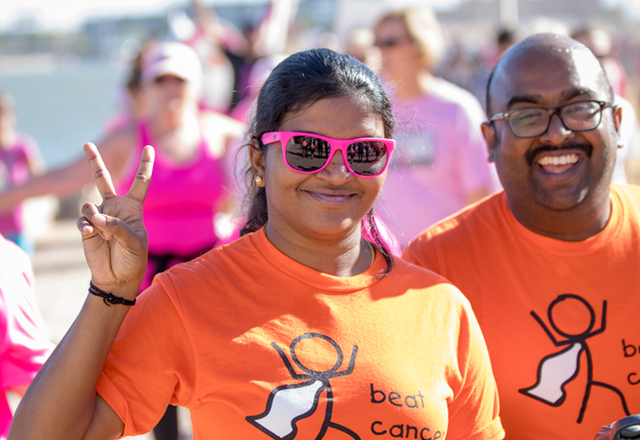 The events raise money to fund innovative research, provide free information and support, and to help people reduce their breast cancer risk or find it early when it's most treatable. From the opening ceremony to the post-walk entertainment, a Making Strides event is a celebration of survivors and opportunity to remember loved-ones lost. It's a day that shouldn't be missed and won't be forgotten. 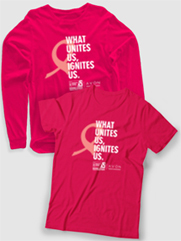 The American Cancer Society depends on Making Strides Against Breast Cancer events to raise awareness and funds to save lives from breast cancer. And Making Strides events can't happen without people like you. Through your time, effort, and dedication, you're shining a light on the issue of breast cancer. By walking in an event, raising funds, volunteering or forming a team, you're helping the American Cancer Society find solutions through new treatments and support services. You're making a difference in the lives of so many. And for that we are grateful. The best way to learn about Making Strides events is to hear about it from the participants themselves. Let this story inspire you and then share your own story with us. Tom Bozzo lost his wife Gail Shovlin to breast cancer in 2015, but as his daughter Sophie often reminds him, she’s still there for them. “Dad – you should just talk to Mom when you need her or need help. That’s what I do,” she tells him. She finds her mom in the clouds, feels her in the wind, and thanks her for gifts every day. “I bet Mom gave us this beautiful day,” she’ll tell her father. When Gail was diagnosed at 39 years-old, she was determined to not just beat her breast cancer but to beat breast cancer all together. And so she began an aggressive treatment. And she also began supporting her local Making Strides Breast Cancer walk. In 2010, almost exactly one year after her diagnosis, she walked in the first of what would be many Making Strides walks. In the years that followed, with her cancer in remission, Gail grew her team to over 60 walkers and raised thousands and thousands of dollars to save lives from breast cancer. But in 2012, the cancer returned, worse than before. Gail renewed her treatments and continued her support for Making Strides undeterred. And though she was just as determined as before, unfortunately the treatment was unsuccessful and Gail passed away. New cases of invasive breast cancer will be diagnosed. be diagnosed (CIS is non-invasive and is the earliest form of breast cancer). If you or someone you love is concerned about developing breast cancer, have been recently diagnosed, are going through treatment, or are trying to stay well after treatment, we can help you find the answers you need. The basics on breast cancer from A to Z such as what it is, how it forms, and how common it is. There's no sure way to prevent breast cancer but there are things you can do to lower your risk. Many women with breast cancer have no symptoms. That's why regular breast cancer screening is so important. If you've been diagnosed, you've probably heard a lot of different terms used to describe your cancer. Choices for treatment will depend on the type and stage of your breast cancer, your age, overall health, and your personal preferences. There are many different types of breast reconstruction surgery. Learn about your options and what to expect before and after surgery. Benign (non-cancerous) breast conditions are very common and are non life-threatening. What to expect and some tips for those living with or living after cancer.